T-Mobile G2 pre-order starts today | Android Blast! The T-Mobile G2 is almost here and now you can pre-order one from Best Buy. Best Buy Mobile today announced the T-Mobile® G2™ with Google™ will be available for pre-orders starting Friday, September 10. It will launch in stores October 6 and will retail for $199.99 with new two-year activation. By adding the T-Mobile® G2™ with Google™ to its assortment, Best Buy Mobile furthers its position as the place for consumers to research and purchase the smart phone that is right for their needs. 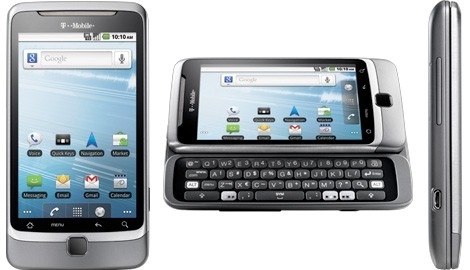 Best Buy Mobile has the most under smart phones under one roof, including the iPhone 4, HTC EVO 4G (Black or White version), the full line of Samsung Galaxy smart phones and the BlackBerry Torch, among others. The G2 is T-Mobile’s first phone on its advanced network that lets consumers connect at 4G speeds. It has the Android 2.2 operating system, an exclusive hinge design (HTC calls it “Z-Hinge”) that opens up to a QWERTY keyboard and a full touch screen 3.7” S-TFT WVGA with clear images and wide viewing angle. Pre-orders can be made by visiting any local Best Buy or Best Buy mobile standalone store. At Best Buy Mobile, consumers can compare the latest devices from popular carriers and plans in store or online.